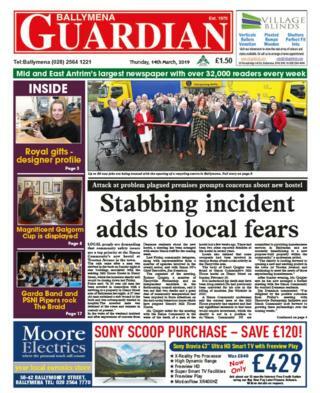 A world record attempt and a special royal gift are among the stories in this week's local papers. 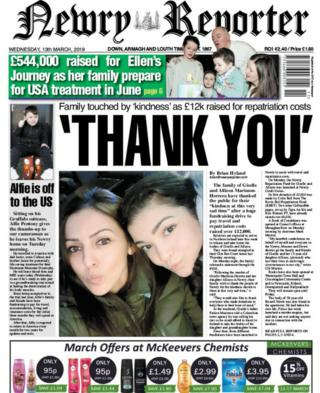 In the Newry Reporter, the family of Giselle and Allison Marimon-Herrera thank the public for their "kindness at this very sad time". A huge public fundraising drive to pay for travel and reparation costs for the family has reached more than £12,000. The bodies of Giselle, 37, and Allison, 15, were found in their Newry home on 7 March. Post-mortems showed Allison had been strangled and that there was a "strong possibility" that her mother Gisele had been as well. The body of 38-year-old Russell Steele was also found in the apartment - police said he died by hanging. On 11 March, the family released a statement through the PSNI thanking "everyone who has made donations to help them in their hour of need". Giselle Marimon-Herrera's father told a Colombian news agency he was selling his taxi so he could afford to travel to Northern Ireland to take the bodies of his daughter and granddaughter home. Since then, three different fundraisers have been launched in Newry to help with his costs. Now, to the Ballymena Guardian, which features the profile of local jewellery designer Vera McCullough, who was commissioned to make two pieces for the Duke and Duchess of Cambridge. Prince William and Catherine were presented with the gifts which featured their birthstones, during a recent trip to Ballymena. Vera, who has a studio at the foot of Slemish Mountain, created a set of silver floral cufflinks for William and a brooch, which can be worn as a pendant, for Catherine. She said: "It's not often you get an opportunity like that and it was such an honour for me to make something special for the royal couple". She also told the newspaper that she is now receiving worldwide attention for her work, getting calls from America, Australia, Canada and Africa. 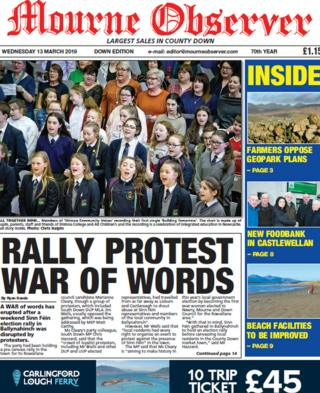 In County Down, the Mourne Observer explains that district farmers are "unanimously opposed" to achieving geopark status for Mourne, Ring of Gullion and Strangford and Lecale. The paper reports that the Ulster Farmers Union (UFU) met both the council and Geological Survey of Northern Ireland last week. Farmers rejected plans to submit an application to UNESCO for Global Geopark status, which would seek to "recognise the international significance of this area's geology". Supporters of the application believe it would bring increased recreational opportunities and promote social inclusion. But the UFU are concerned with the proposal, with president Victor Chestnutt stating: "I would like to remind officials that farmers have been the custodians of this land for decades." Mr Chestnutt added that council officials "believe and are promoting, that this designation will not restrict the operations of any farmer within the borough". "This is unrealistic and their approach is disappointing," he said. In Fermanagh, the Impartial Reporter leads with "shocking figures" showing the extent of domestic abuse within the county. The newspaper reports that urgent requests for help from women in danger of domestic violence are now at an all-time high. According to a new report, four women every day are asking Fermanagh Women's Aid for help. Of the hundreds of women who use the services of Women's Aid, 88% were suffering abuse at the hands of a current or former close partner. In her 16 years with Fermanagh Women's Aid, CEO Mary McCann has seen many cases involving violence, manipulation and coercive control. She said: "While years ago, a worker could sit with a woman and support her in staying safe in the situation, the majority of women now have to be removed in a hurry. "We work on a shoestring and we now have a four-month long waiting list. We can't have a waiting list if a woman's life is in danger." And finally, the Lurgan Mail reports on how a school commemorated a much-loved pupil. Lismore Comprehensive School in Craigavon attempted a world record in memory of student Maddy-Leigh Harbinson who recently died aged 11. Principal Fiona Kane said her death in February had "a devastating impact on the whole school community". Maddy-Leigh died from undiagnosed type 1 diabetes and after her passing, her friends wanted to raise awareness for Diabetes UK. The current record stands at 847 people and Lismore Comprehensive confirmed on Thursday that 1,170 members of both student and staff took part, calling it an "amazing success".